Versatile, committed, eloquent, and talented are all adjectives that describe actor and activist Edward Asner. 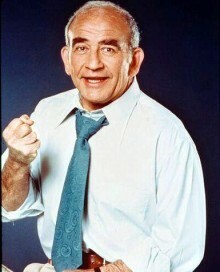 Asner is best known for his comedic and dramatic crossover as the gruff but soft-hearted journalist Lou Grant, the role he originated on the landmark TV newsroom comedy “The Mary Tyler Moore Show.” Lou Grant’s story continued in the newspaper-set drama “Lou Grant,” which earned Asner five Emmys and three Golden Globe Awards. Asner received two more Emmy and Golden Globe Awards for the mini-series “Rich Man, Poor Man” and “Roots.” His prolific and much honored acting career demonstrates a consummate ability to transcend the line between comedy and drama. One of the most honored actors in the history of television Asner has been the recipient of seven Emmy Awards and 16 nominations, as well as five Golden Globe Awards, and served as National President of the Screen Actors Guild for two terms. He was inducted into the TV Academy Hall of Fame in 1996. Asner received the Ralph Morgan Award from the Screen Actors Guild in 2000, presented periodically for distinguished service to the Guild’s Hollywood membership. In March 2002, he was again honored by The Guild as the 38th recipient of the prestigious Life Achievement Award for career achievement and humanitarian accomplishment, presented annually to an actor who fosters the highest ideals of the profession. In addition to his professional versatility, Asner has consistently served and committed himself to the rights of the working performer in addition to advocating for human rights world peace, environmental preservation, and political freedom. A passionate and informed spokesperson for the causes, Asner is a frequent speaker on labor issues and an ally for some of the acting industry’s older artists. He has received the Anne Frank Human Rights Award, The Eugene Debs Award, Organized Labor Publications Humanitarian Award, American Civil Liberties Union’s Worker’s Right’s Committee Award, and the National Emergency Civil Liberties Award. Do you want to hire Ed Asner? Directly request a quote. In 48 hours we can send you the availability of Ed Asner If you would like to book Ed Asner, Entertainment Booking Agency is the right place. We will offer you the best price and contact the management or we directly contact Ed Asner. For corporate appearances or speaking engagements you can contact our agents and the will help you true the process. Tags: hire Ed Asner, Ed Asner booking, book Ed Asner, Ed Asner appearances, find more information on booking Ed Asner for appearances, Ed Asner speaking engagements, Ed Asner endorsements/spokesperson, Ed Asner appearance fees, Ed Asner booking agency contact info, biography of Ed Asner, Contact an artist booking talent agent find a speakers bureau that can book Ed Asner, speaker booking agency for Ed Asner, Ed Asner booking agency, Ed Asner booking for corporate event. EBA is one of the biggest entertainment booking agencies in the World. We book hundreds of celebrities, artist, athletes and speakers in a year. Important to know is that we are not claiming to be the management of Ed Asner. We are not the official agent for Ed Asner. Companies from around the globe book these artists and speakers true our company be course we have one of the biggest networks and we always have direct contact with the artist or the management. We help you to find the right celebrities for your corporate of private events. Please contact one of our agents to get free advice and we will help to get the world-famous artist on your party.